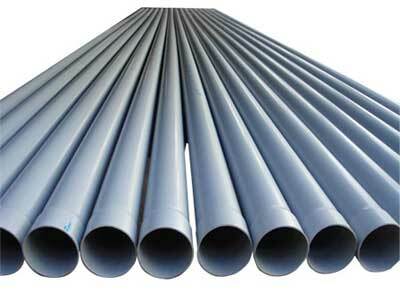 We offer superior quality PVC Pipes in the international market. We have carved a niche for ourselves as one of the top PVC Plumbing Pipes Manufacturers in India. Our PVC Plumbing pipes are offered in different ranges as per the demand of the clients. Besides, we are also counted among the foremost PVC Irrigation Pipes Suppliers. Selfit pipes are manufactured in the range of 32 mm to 200 mm diameters in 2.5, 4, 6, 8, 10 and 12.5 kgf/cm2 working pressure. Selfit sockets are formed with high precision on specially developed sophisticated machines. 50% saving in installation time, as compared with plain ended pipes and loose couplers. The number of joints is reduced by 50%, resulting in substantial saving in labour costs. Cost less than conventional plain ended pipes with loose couplers. Eliminates the inconvenience of loose couplers, and reduction in inventory costs. Plain pipes are available in 355 mm & 400 mm diameters in 2.5, 4, 6 and 10 kgf/cm2 working pressure. Selfit pipes are supplied in a standard length of 6 meters exclusive of the socket portion.